Prior to eating your fresh and juicy mango, it’s important that you know how to clean a mango! Just like all other fruits and vegetables, you should be cleaning your mangos before consumption – even though you’re not eating the outside skin. According to the U.S. Food and Drug Administration (FDA), 48 million people get sick by contaminated food each year since produce is passed through many hands before it finally reaches your kitchen. To help prevent any illness, you can take some easy steps at home to clean your mangos and all other produce. Sanitize your hands, work area, utensils and cutting board before handling or cutting any fruits or vegetables, especially if you’ve handled any type of meat or seafood. The FDA recommends washing your hands with warm water and soap for 20 seconds. 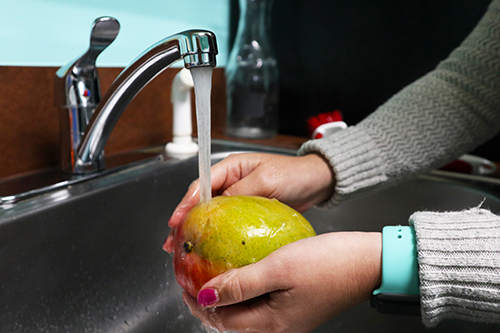 Rinse your mangos under running water and gently rub them with your hands and fingers to remove any residue. Ensure you do this prior to cutting, so bacteria aren’t transferred from your knife to the mangos. Dry your mangos with a clean cloth or paper towel to remove any leftover bacteria. Now you can cut into your mangos with a clean knife and enjoy!